More of everything connected with World War 3: more fear; more antiMuslim propaganda; more relentless conditioning by the Corporate Media. Everything which has been evident over the last two-three weeks was again in play this past week. Except one thing. 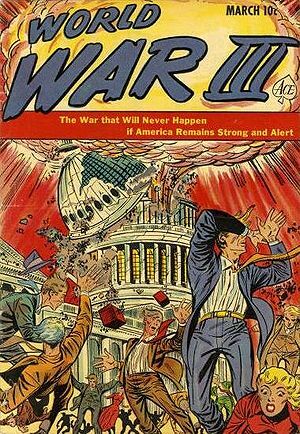 The number of headlines which contained the phrase “World War 3” or “World War III” was down. Back at the beginning of the summer, a lull in the Corporate Media hype regarding World War III occurred. Is a similar lull in store for the ending of summer? It might be useful to recap what was stated here last week regarding the “markers” this corner has been watching for. These are events which we feel will preclude the beginning of WW3. A horrendous terror attack on the USA. The level of propaganda prior to the USA marching to war will be elevated. The creation of a formidable Muslim enemy; e.g., the Caliphate. Propaganda blaming a possible loss of the war on “traitors” in the government (secret undercover Muslim president Barack Obama?) will escalate. For a fuller discussion of these five points, the reader may refer to World War 3 Watch: August 18, 2014. Again: for a little while longer, the regular media cycle will predominate. 1- An event takes place which could spark war; 2- The media covers said event 24/7; 3- Speculation continues about the event and its likelihood of causing World War III; 4- An uneasy return to “normal” until the next event. Events in Ukraine will serve as distractions for actions in Gaza, Syria and Iraq. The current news cycle concerning Ukraine has just about outlived its usefulness. If Ukraine is to continue in this manner, new, more violent actions will have to take place in Ukraine. The Ebola threat continued this past week. As did the constant media threat of an EMP (electromagnetic pulse) attack. Again, regardless of what hot spot the media is featuring this week, one suspects that when WW3 does finally begin, it will begin in that most volatile of regions, the Middle East. THE CALL: Event will continue to escalate in Iraq and Syria concerning the new foil for American war: ISIS. Propaganda will escalate faster than the events. This observation from last week continues to be true this week. THE BAD NEWS: The propaganda campaign, which is necessary to prepare a country for total war, continued to escalate this past week. This has accelerated over the last three weeks. Expect a continued media focus on Muslim atrocities and Christian persecution. THE GOOD NEWS: Once again, Asia and all of the other “hot spots continue to be relatively quiet last week. North Korea did test fire three missiles this past week. Should we continue to fear another World War? This last headline is a bit odd. So-called Iraqi “Christian” leaders demanding protection from man? This is not something the world would find odd. It is, however, something which might raise the eyebrows of a true believer. Ukraine – Continues to simmer. Events are on an up-and-down pattern. This past week, violence was STEADY. However, these events are distractions. IRAQ: The hand-wringing over a Caliphate continues. The world seems powerless to stop ISIS. Bombs don’t seem to stop them. It’s looking like only a full-scale war will do it. The escalation of the propaganda involving ISIS and Iraq this past week continue last week’s ominous turn. GAZA: Israel and Hamas continue to kill each other’s civilians. SYRIA: Syria thrust itself back into the news headlines as the possible new front in the “War against ISIS.” Once war begins, it will be hard for it to not escalate in one capacity or another. There’s a 42% chance of World War III; which is up 2%. This is the immediate likelihood of the commencement of World War 3. The long view is 100%. The uptick is due to the continued strong prewar propaganda push targeting the USA. A continued chance of a domestic terror attack before October 2016 leading to war in the Middle East : [+77%}. That’s up 2%. Continued talk in the media of a Muslim terror attack, terror cells already in the USA and terrorists coming across the purposely porous US southern border. The tone of the pre-war propaganda escalated sharply the past three weeks. Expect this number to gradually increase until the actual attack. USA – steady with Iraq and Syrian war talk. Government interest in Ukraine is minimal; interest in Israel/Gaza is hands-off. Israel – steady. Ground war in Gaza grinding on. Iran – Steady, though action of elite Iranian units in Iraq were reported. Iraq – Up. Continued chaos by “ISIS.” USA talking of resuming war. The world is on a steady march to World War 3. There will be periods of calm, periods of violence. Even during the periods of quiet, nothing will deter the beginning of World War 3. It’s only a matter of timing. The one question that never gets asked: How did the media know the latest events will lead to World War 3? The WW3 headlines began back last year in 2013. In May of 2013 this writer had a conversation with a fellow about the media using the term “World War 3.” The fellow claimed “I haven’t seen it.” The response? “It’s just beginning.” At that time, the question was asked “How does the media know the events will lead to World War 3? Why is this outcome written as if it’s a foregone conclusion? The pre-war propaganda concerning ISIS continues to escalate which is significant for World War 3 watchers. In last week’s report (August 18), our speculation changed for the first time in almost a year. We will continue to hold to this SPECULATION until events prove us right or wrong. Due to the sharp escalation in propaganda, an event could possibly take place prior to 2015. The next five months bear increased scrutiny. Usually, before any big war, there is at least one “dry run”–which is an event which look like “war for sure.” Then, things quiet down before the war begins. One question: Before the USA goes to war, will it go through the drama of gathering UN support as it has for the last 23 years? Overall Tension Assessment: Iraqi violence continues. Syria is opening up as a front. Is this merely Syria’s “turn” in the headlines or does it signal Syria will become the site of a future Muslim-West war? Israel-Gaza is churning. It is suspected that Syria, Libya, Iran and China will take turns leading the World War III discussion before war actually breaks out. The world is still relatively quiet but time is running out. The media continues to stoke war fear. People are clearly nervous about the potential for World War 3. Enjoy the relative peace for at a little while longer.